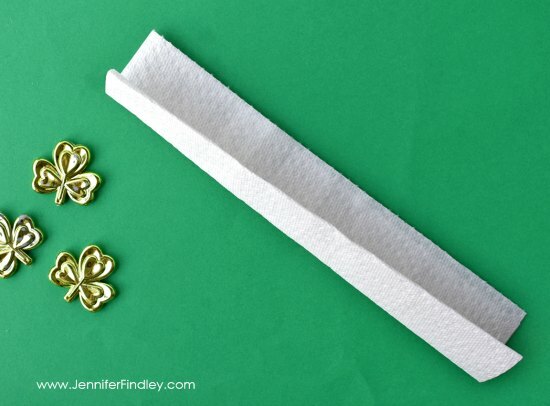 St. Patrick’s Day is a fun little holiday that comes during a time in the classroom when behavior can be a bit dicey. 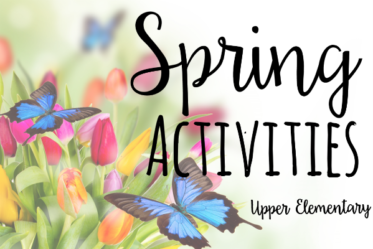 State testing is on the horizon but so is Spring Break. Those don’t often make the best combinations in the classroom. However, St. Patrick’s Day can add a bit of fun and whimsy into what can otherwise be a stressful month. 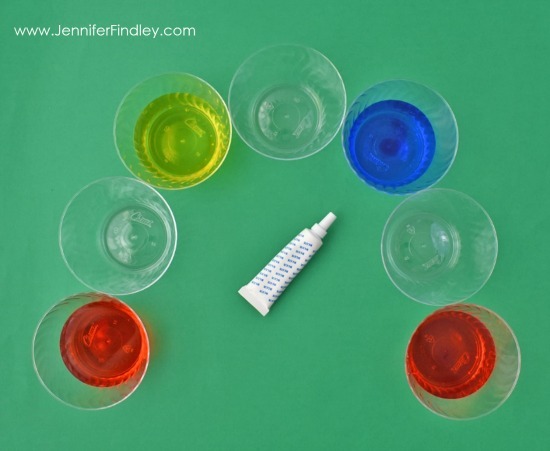 This post will share a favorite science demonstration that is perfect as a St. Patrick’s Day science activity. For more St. Patrick’s Day activities and resources for other subject areas, click here. reading passage and questions —download for free at the end of this post. Each cup will need its own paper towel. 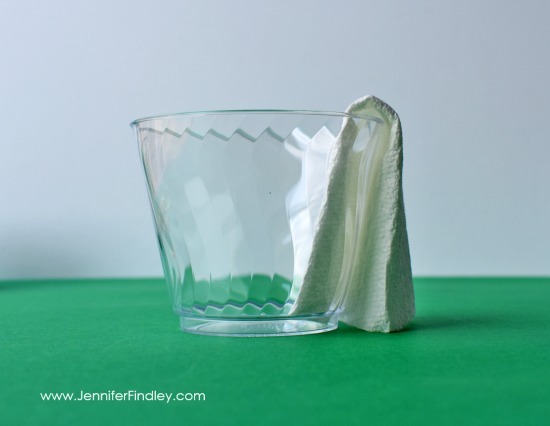 Fold and trim the paper towels so that they will rest easily into the cups. Like in the photo above, you will want the paper towel to touch the bottoms of each cup, but not rise up too far out of the top. 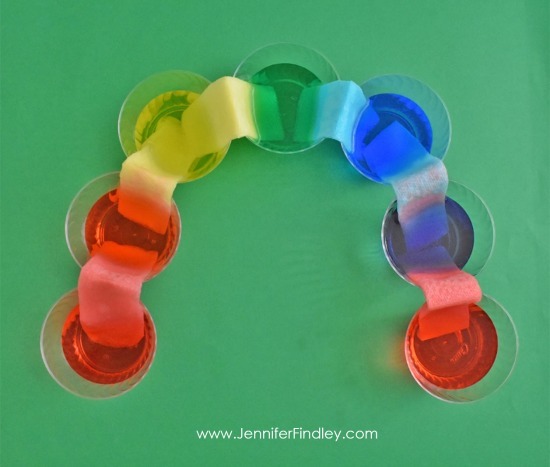 Line up the cups in an arc to resemble a rainbow. 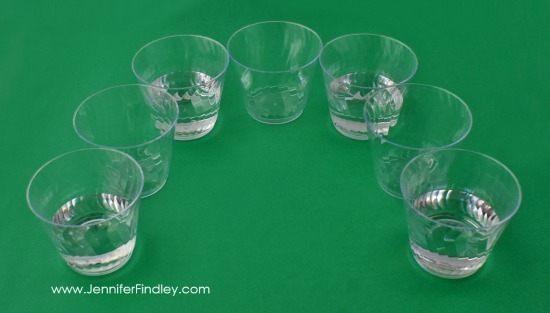 Use a pitcher to fill cups 1, 3, 5, and 7 with water. Leave cups 2, 4, and 6 empty. Because the next step involves adding food coloring and stirring, fill up the cups only half way. This will make the next step easier if you choose to have the students do the stirring. Stir a few drops of red food coloring into cups 1 and 7. Stir a few drops of yellow food coloring into cup 3. Stir a few drops of blue food coloring into cup 5. Insert a folded paper towel into each cup as shown above, so that one end of the paper towel is in a cup with colored water and the other end is an empty cup. You’ll see the colored water almost immediately starts climbing up the paper towels. Using your pitcher, carefully add more water to the cups with colored water so that they almost reach the top. Be sure to leave cups 2, 4, and 6 empty. Leave your cups alone for a couple of hours and when you return you’ll have a rainbow! 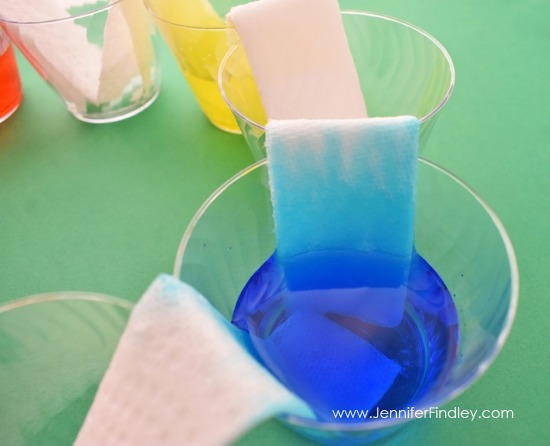 Similar to how water “climbs up” the roots of plants from the soil, the colored water in the cups climbs up the paper towels, against gravity. 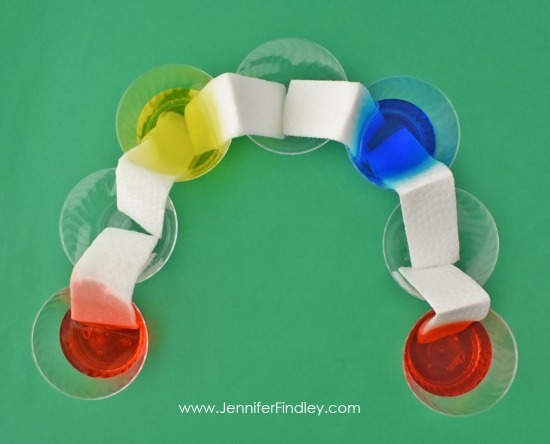 This is called capillary action. The paper towel is a very absorbent conduit, so the colored water is able to move through it very quickly. It then drips down into the empty glass. When the red water from cup 1 mixes with the yellow water from cup 3, cup 2 ends up orange. The yellow water from cup 3 mixes with the blue water from cup 5, and cup 4 ends up green. To complete the rainbow, the blue water from cup 5 mixes with the red water from cup 7, and cup 6 ends up purple. I like to incorporate reading and writing into every science experiment, activity, or demonstration that we do and this is no exception. For this activity, the students will read a short text that describes the science behind it (similar to what is explained above for the teacher reference). 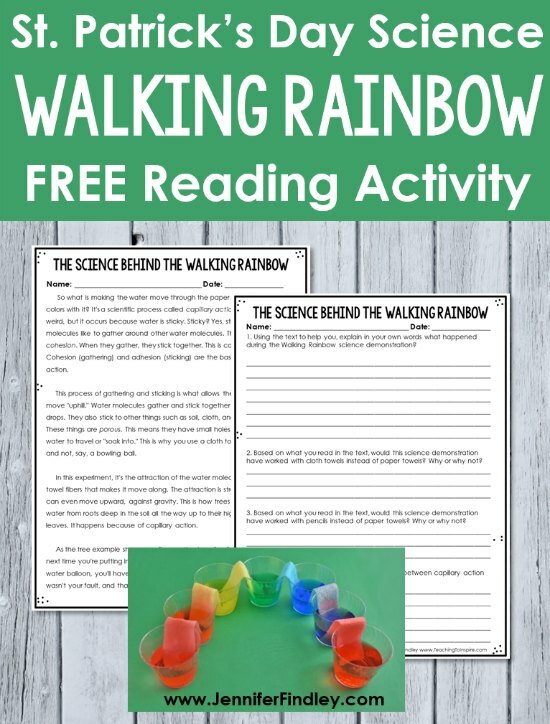 Then the students will use the details they learned in the text to explain what happened during the Walking Rainbow science demonstration. They will also answer three more questions using details from the text. 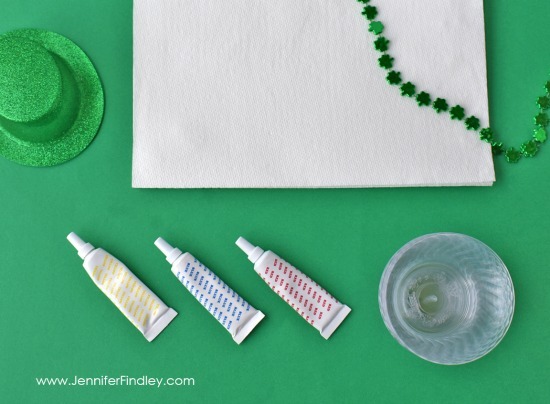 Click here or on the image to get the reading activity and printables that accompany this St. Patrick’s Day Science Activity. 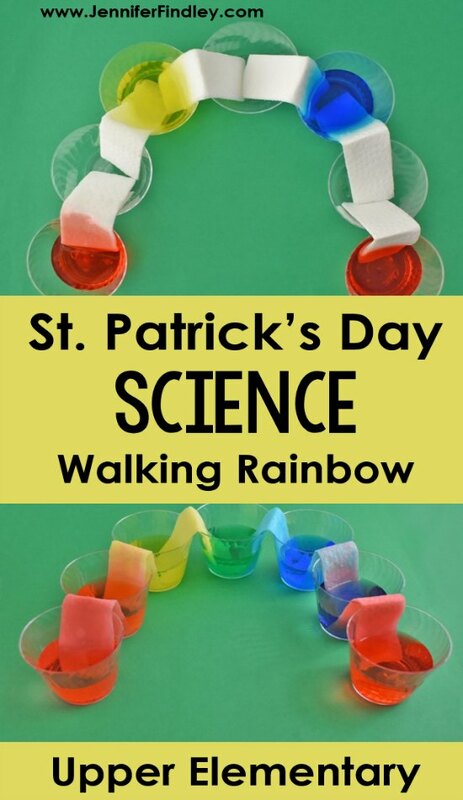 What are your favorite St. Patrick’s Day science activities or STEM activities? Let me know in the comments. 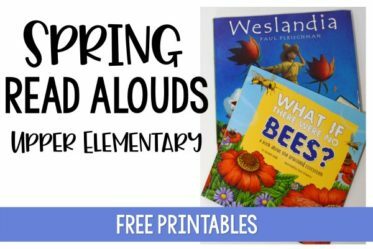 I am always looking for new ones that my students will love. 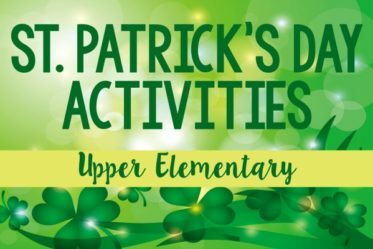 If you want more activities, resources, and even freebies for St. Patrick’s Day, click here to check out my recommended activities. 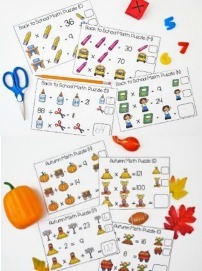 The post was created in collaboration with A. Stults.